With the holidays right around the corner, parties and celebrations are on everyone’s minds and calendars. From sit down dinners with DJs and dancing, to cocktail soirees with light bites and festive décor, ‘tis the season for merriment and fun. Corporate holiday parties are also a great way to show your appreciation for customers and employees, as well as sharing your values and corporate culture. For businesses and brands that truly care about the environment, however, corporate parties can be a challenge to plan, due to the waste that they can generate. From leftovers, to paper and plastic waste, as well as increased energy consumption, events large and small can become an environmental nightmare. As a nationally recognized thought leader in environmental and sustainable living, East End Market & Event Center has shared their top tips to help make your holiday party planning more planet friendly. Given that the majority of modern business communications are now in digital form, well designed email invites are an obvious solution to reducing waste. Dozens of platforms like Paperless Post, Celebrations.com, and Evite carry premade and fully custom invitation design options, to help you create a thoughtful, stunning invitation that’s sure to impress guests. Although steak dinners and lavish roasts have been common at holiday parties for centuries, new studies are shining a light on the environmental benefits to serving vegetarian dishes and lower impact dishes at your next corporate holiday party. Recent science has found that grains, fruits, and vegetables have the lowest impact on greenhouse emissions, followed by chicken, pork, and fish. In real math, this means that just one quarter pound of beef will produce the same carbon emissions as nearly two pounds of fish, like salmon (noted in the study). Swap in lentils or nuts, and you’re looking at over six pounds of food, by comparison. In addition to helping the planet, making a conscious effort in this aspect of event planning can not only do good, but also create a positive talking point for guests, and highlight your corporate culture and core values, making your brand and event truly meaningful. Sourcing locally can also play its part in keeping your event green. Local farms and growers can provide tasty options like greens and veggies, as well as farm fresh eggs. When choosing an event location and caterer, be sure to ask about what’s in season and locally available, as well as what can be incorporated from local artisans and bake shops. Now that your seasonal food menu is set, why not pair that delicious dish with biodynamic wines, or locally sourced craft spirits or beers? Many producers now make the environment a decision in their choice of packaging, and a locally sourced product will have traveled less of a distance to get to your event, making it a truly ‘farm to table’ or ‘farm to glass’ experience. At a minimum, choose water pitchers and glasses instead of bottled water, as it takes six times less water to fill a glass than what is wasted during the bottling process. If bottles are necessary, look for brands with alternative packaging, like glass or paper based materials that won’t take decades to break down in a landfill. 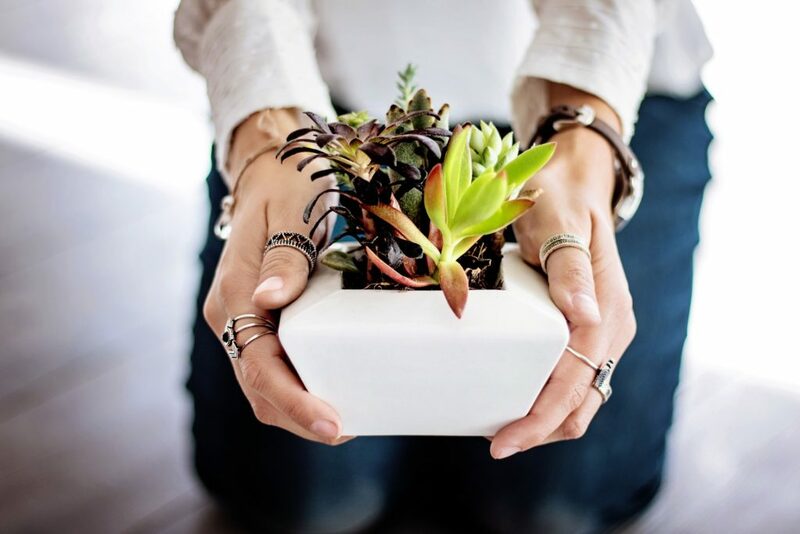 Sustainable arrangements are not only trendy, they are a smart choice for a green holiday party. Choose plants in pots, or grasses like bamboo that will grow quickly after cutting. Long, low arrangements or overhead planters with fresh fruits and vegetables can make conversation much easier, and become talking points, especially if you choose the ‘ingredients’ with purpose and forethought. Printed dinner menus are a beautiful visual, but often discarded after an event. Give yours a life after the party with environmental tips or ‘green’ recipes on the reverse. Soy based inks are an earth friendly choice, as are recycled papers or seed papers that can be planted at home to grow herbs and flowers. Encourage guests to recycle cans and bottles by setting up an attractive recycling station within the event space. Be sure to specify glassware and dishware with the event caterer, as well as washable linens in lieu of paper napkins. Corporate colors can be easily integrated using linens and colorful chargers, without the need for unnecessary waste. At East End Market & Event Center, everything from repurposed architecture, to salvaged building materials, and an organic working garden, speaks to their care for the environment and community. As one of the first businesses in Orlando to help pilot the City’s food composting program, it was important for East End to integrate a recycling program throughout the property, down to the vendor level. The working organic garden in front of the market, the Florida friendly flora of the adjacent courtyard and the market’s edible landscaping create green spaces with a purpose, and great places to host an eco-friendly event outdoors under the stars. Additionally, as a locally headquartered brand, events booked at East End’s event spaces generate three times more dollars back into the local economy, versus an out-of-state corporate owned, or chain location event space. Gift bags and goodies are a fun part of every corporate event. 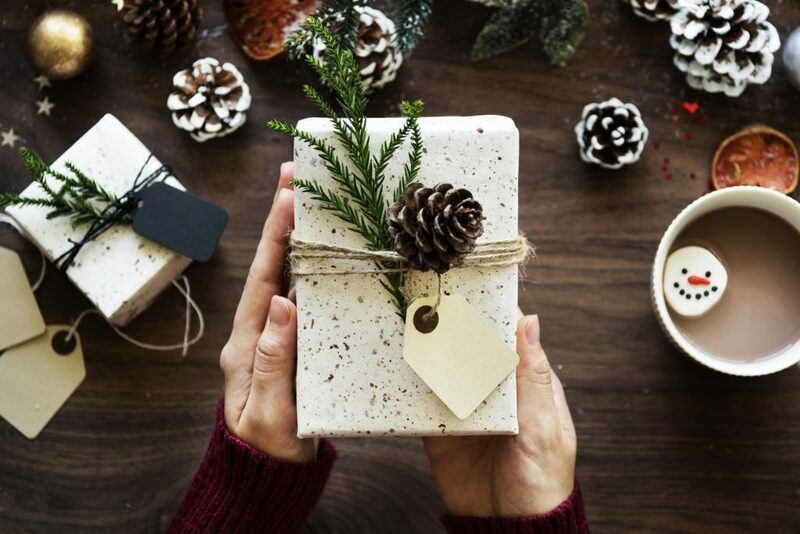 Plan to keep your carbon footprint low here, as well, with thoughtful gifts like small, potted plants in branded mugs, gift certificates to local coffee roasters, or artisan made, fair trade items that can make for a memorable holiday gift. Instead of gift wrap, go with bags that can be reused for shopping or weekend getaways. Upcycled and repurposed items like accessories made from vintage fabrics, plastic bottles, wood, or glass, can be another creative way to show your concern for the environment. Once guests know your environmental goals for your holiday party, why not encourage them to walk, bike or use public transportation to get to the party? Carpooling is another way to reduce carbon emissions, as well as the need for valet. Give out door prizes to the most innovatively green attendees! By planning ahead, and making even just a few of these changes to your corporate holiday party plans, you can reduce your party’s carbon footprint, do good for the environment, and encourage others to do the same. Here’s to a safe, and planet friendly holiday season! 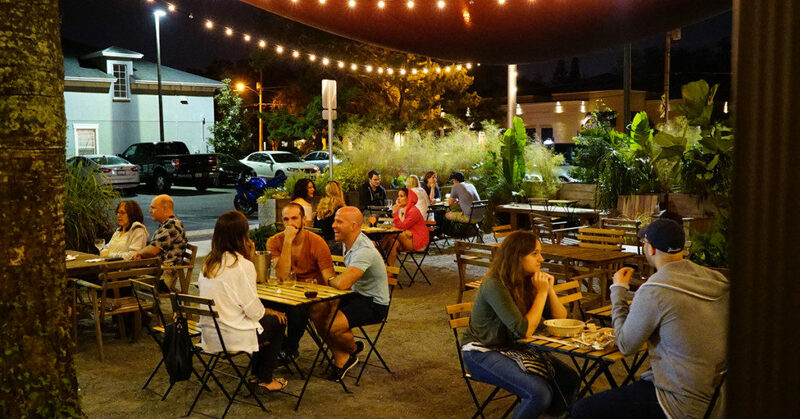 Located in Orlando’s historical Audubon Park Garden District, East End Market & Event Center has been dedicated to raising awareness for eating locally, living and working sustainably, and celebrating the artisanal food producers and makers who call Central Florida home. Created with the understanding that each community is diverse and unique, East End Market & Event Center strives to fill those needs with locally sourced, hand-made, and thoughtfully curated products and services. Their support for local entrepreneurism, and as an artisan food culture destination, has been nationally recognized by top tier publications such as USA Today, New York Times, Orlando Sentinel, Wine Enthusiast, Florida Trend, Edible Magazine, Food Network, and many more. To book an event, please contact them at (321) 236-3316, or online at eastendmkt.com.